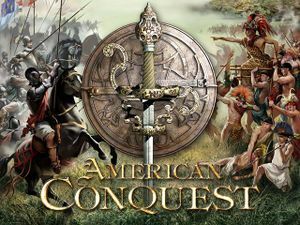 American Conquest: Fight Back is needed to use mods. SafeDisc v2 DRM[Note 1], Key for online-play. Includes American Conquest: Fight Back. Singleplayer and multiplayer demo are both available. The retail version doesn't work properly on Windows 8 and later. Digital versions do not have this problem (see Availability). Like Cossacks, the other title from GSC Game World, American Conquest features a unique engine timing system. 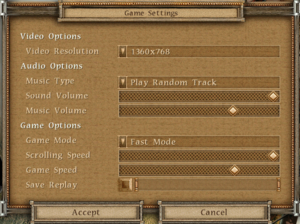 While the games' speed is still dependant on the CPU clock, like many older titles, they offer a flexible speed setting in the options menu to enable the user to tweak the speed to his liking. First try deleting the Video folder in the installation folder. Start the game. If you have one of the 8000 series nvidia graphics cards, or a similar ATI card, and are running Windows XP, download this ddraw.dll and again, place it in the installation folder. Also be sure you've deleted the Video folder as in step 1. Try starting the game again. If you are running Vista or Windows 7, download dmcr.zip and extract the DMCR.exe into the folder. Try starting the game again. If this doesn't work, and you also have the ddraw.dll in the installation folder from step 2, delete ddraw.dll, and try starting the game again. Antivirus software may think this is a virus, but it assuredly is not. This sometimes happens on Windows XP when with 3 or more players on LAN. Note that this is a workaround for this and not an actual fix. Start your multiplayer game as usual, let all players select their nations, and then click the “Ready” button. Now choose the game settings. You will see it still sits on 0% or starts going up very, very slowly, don't panic, press Alt+Tab ↹ to go to desktop, wait a second and then go back in the game and you will see it has progressed, again Alt+Tab ↹ out of the game, wait a second and go back into the game, again it will have progressed. Keep doing this until it reaches 100%, then click begin game and there you have it! It can take around 4-5 minutes, sometimes you can stay on desktop for a couple of minutes and then go back into game if it hasn't progressed. This kind of issue manifests itself on laptops using Intel Core i3/i5/i7 CPUs, and Nvidia GPUs through Optimus technology. A workaround is possible, though not guaranteed to work. Try fixing this with this tutorial originally intended for Red Alert 2. An attempt to improve AI in the game for England, France, Spain, USA, Maya and Iroquois. The main work is on larger city with higher population for a more satisfied battle after a long peacetime. It is only for land battle - the water AI was untouched. May break AI in multiplayer games. ↑ 2.0 2.1 File/folder structure within this directory reflects the path(s) listed for Windows and/or Steam game data (use Wine regedit to access Windows registry paths). Games with Steam Cloud support may store data in ~/.steam/steam/userdata/<user-id>/115210/ in addition to or instead of this directory. The app ID (115210) may differ in some cases. Treat backslashes as forward slashes. See the glossary page for details.